Start each day deliciously. 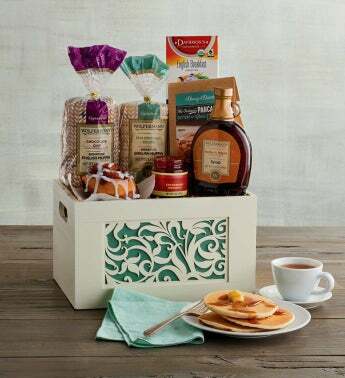 Inside this beautiful white wooden crate with cut-out handles are a variety of delightful treats. This unique bakery gift includes a cinnamon roll made in our own bakery, two flavors of super-thick signature English muffins, strawberry preserves, buttermilk pancake mix, butter and maple natural-flavored syrup, and English breakfast tea.